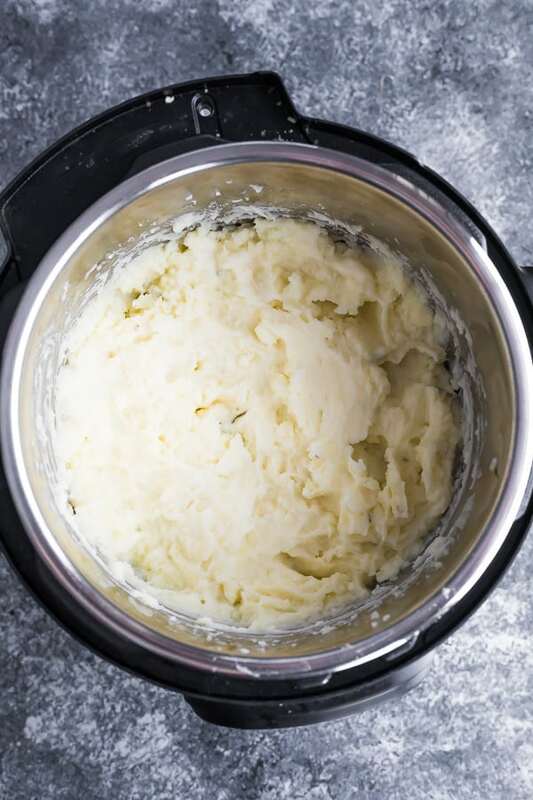 Herb & garlic Instant Pot mashed potatoes are simple to prepare and can be made ahead and kept warm in the Instant Pot. Perfect for a holiday feast. Mashed potatoes are always a staple at our Thanksgiving and Christmas table, because they are such a crowd pleaser (and you have to have at least one thing the kids won’t fight you on, right?). I’ve been making my mashed potatoes in the Instant Pot for the last 2 years and it’s about time I share my Instant Pot mashed potatoes recipe with you! I usually change up the recipe every time I make these mashed potatoes, so I’m adding a ton of options for you to make these your own. You might notice this recipe is a little on the ‘not so healthy’ side, and that’s because it’s what we serve for a holiday feast! I’ve included some notes in the recipe with ways you can lighten this up for an every day meal. 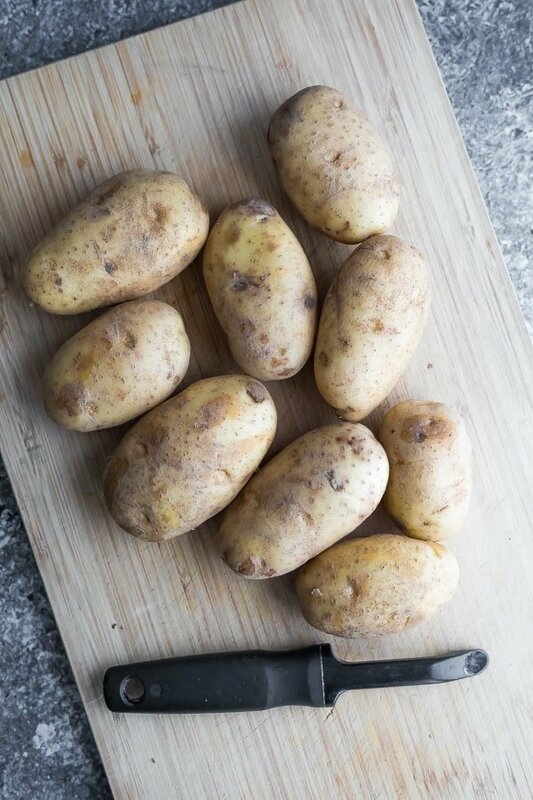 You can use any potato for homemade mashed potatoes, but I prefer russets as they are starchy and end up really fluffy when mashed. add water until they are *just* covered. Around 3 1/2- 4 cups water. remove the woody herb stems, carefully drain off the water, and get mashing! How convenient is that? You can keep them warm so you can actually interact with your guests at Thanksgiving or Christmas. Or fuss with the turkey! 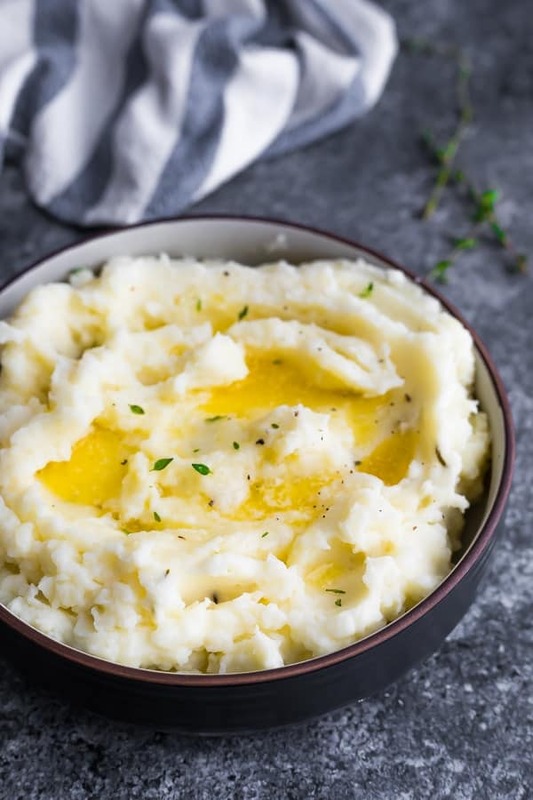 What are some ways to mix up this Instant Pot mashed potatoes recipe? So so many ways! Can I make these homemade mashed potatoes ahead of time? Unfortunately they aren’t nearly as good on day 2 as they are fresh from the Instant Pot; homemade mashed potatoes tend to dry out a bit. Adding an extra bit of milk or cream to the re-heated potatoes helps if you are serving leftovers, but for a Thanksgiving or Christmas dinner, I’d try to serve these within a few hours of cooking them. How much mashed potatoes should I serve per guest? I’d aim for 1/2 cup portions. This recipe makes 6-8 portions, so you might want to 1.5 or double it. I doubled this mashed potatoes recipe for Thanksgiving this year, and my Instant Pot was very full but it worked great…just be careful when releasing the pressure. 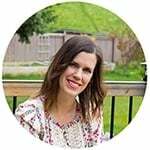 Can I make this herb & garlic mashed potatoes recipe vegan? These white bean mashed potatoes from Cotter Crunch look insanely creamy! 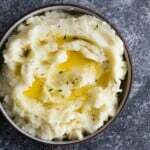 Can I make this herb & garlic mashed potatoes recipe low carb? 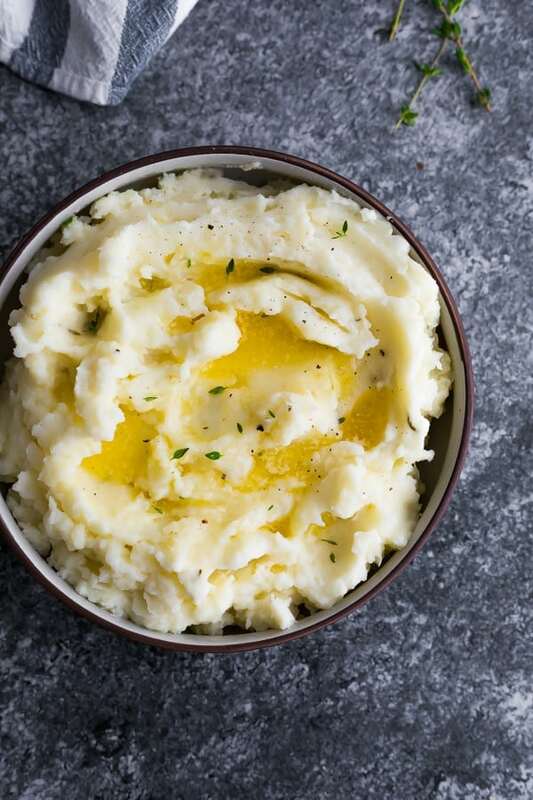 Try this Instant Pot Mashed Cauliflower recipe! I made a double batch of these for Thanksgiving in my 6 quart Instant Pot, it was VERY full but worked fine; just be careful when releasing the pressure! Looking for more Instant Pot Thanksgiving recipes? Try this Instant Pot Mashed Cauliflower, this Instant Pot Wild Rice Pilaf, and this Instant Pot Cranberry Sauce! 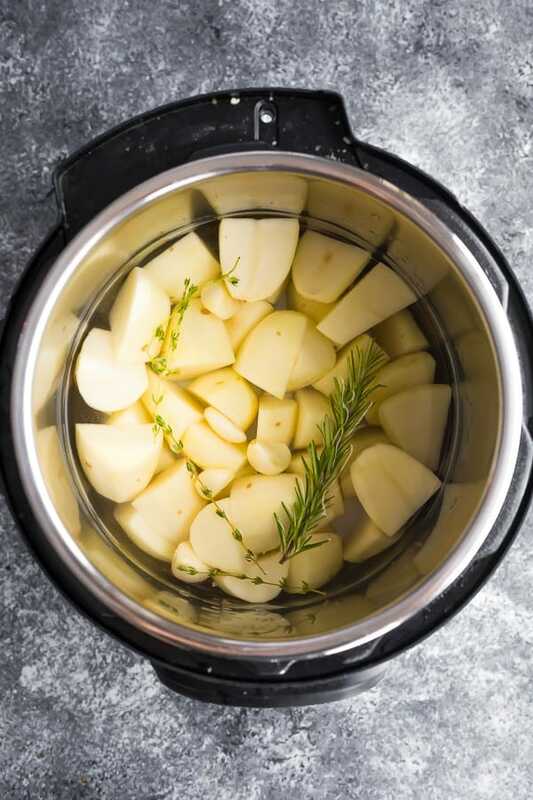 In the base of an Instant Pot, combine the potatoes, garlic, rosemary, thyme and water. Put the lid on the Instant Pot, set the valve to 'sealing', and select manual (or pressure cook) for 10 minutes. When the Instant Pot beeps, release the pressure immediately (do this gradually if you doubled the recipe!). Remove the rosemary and thyme stems, and carefully drain off the water. Mash the potatoes, then stir in the butter, salt and cream. Add more cream or milk to your liking. Serve immediately or keep the potatoes warm on the 'keep warm' setting on your Instant Pot. Leftover potatoes keep for up to 4 days. You might wish to add more milk to them after re-heating. * I went full butter and full cream for this recipe because it's what we serve for a holiday feast. If you'd like to lighten it up, I suggest swapping the cream for a combination of yogurt and milk, and reducing the butter by half. to lighten this up you said about a combo of Greek yogurt and milk? But how much?! Wasn’t sure if you had tested anything! Hi Alison! I’d try starting with 1/2 cup greek yogurt and add in the milk as needed to thin it out. This are just estimates because I never really measure. I hope you enjoy!